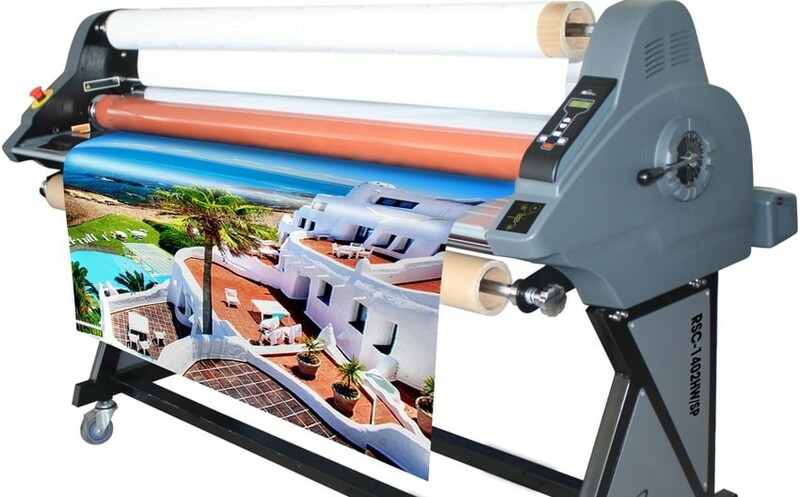 Wide format laminators are ideal for use with large applications such as promotional signs & banners. All wide format laminators are floor standing models, (some can be placed on a table) and can handle documents anywhere from 42" - 63" wide. Popular applications for wide format lamination includes large posters, graphic signs, charts, maps, trade show signage and displays, and more. Let's discuss the pros and cons of wide format laminating. For two sided laminate, two rolls of laminating film are used while for one sided laminate, one roll is used. There is a wide variety of lamination film available on the market today, however the most frequently used is thermal film. Thermal film is constructed of two layers; a polyester layer and an adhesive layer. During the laminating process, the adhesive is warmed and melted. It is then pressed into the document acting as a bonding agent. As the adhesive cools, it hardens and creates a permanent seal between the document and the film. Some form of trimming is usually required with roll lamination. This lamination process is generally used for larger volume items as it can run at higher speeds and in a continuous roll. Many wide format laminators also have the capability to mount on foam boards, and do cold lamination (pressure sensitive laminating). Pressure sensitive laminating applies laminate or adhesive using high pressure rollers, without the use of heat and electricity; this makes them environmentally friendly. There is no more waiting for your laminator warm up, these machines are ready to go right away and require no cool down time. Pressure sensitive laminate is sticky to the touch, and features a removable release liner that covers and protects the adhesive. What sets the cold laminator apart? They are perfect for laminating and mounting for outdoor signage and display. It's difficult to find hot lamination that has the UV protection necessary to keep your outdoor displays vibrant, but UV protective cold lamination is readily available.